What Are The Common Causes of Chronic Fatigue Syndrome CFS? The question of what causes chronic fatigue is a good one, but it's not a question that medical opinion has found an answer for - at least, not yet. 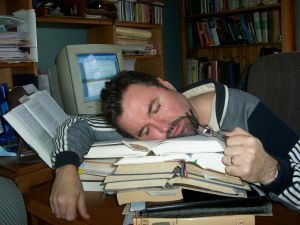 There is plenty of research going on into what causes chronic fatigue and maybe they will come up with an answer. In around 80% of cases, chronic fatigue syndrome develops after the person has had a viral illness. In the early stages of identifying CFS or ME as it was known (and is still known by some people), it was thought to be caused by a particular virus. One possible offender was the virus called Epstein-Barr or EBV which is the cause of mononucleosis (known as glandular fever in some countries). However, it soon became clear that other viruses could trigger CFS too. So what causes chronic fatigue syndrome does not seem to be one particular virus. It appears to be the body's response to a viral illness or, sometimes, an allergen (a substance to which the body is allergic). In cases where a person has not had a viral illness right before developing chronic fatigue syndrome, they have often been exposed to pollutants or other substances to which they are allergic. Instead of asking what causes chronic fatigue, we might ask instead what causes one person to develop chronic fatigue when others do not. Is it infectious? It seems that sometimes many people from the same workplace or social group will go down with chronic fatigue. However, most cases occur in isolation. Perhaps some contagious diseases are more likely to trigger it than others, so that one virus will cause a major outbreak, while another virus will cause only a few people to suffer from chronic fatigue. These are some of the conditions that have been suspected of contributing to a person suffering from chronic fatigue where another does not. No particular gene has been identified, but sometimes chronic fatigue seems to run in families. People with CFS sometimes seem to have unusual levels of serotonin and dopamine, the neurotransmitters involved in feelings of pleasure and satisfaction. Some sufferers take a supplement known as 5HTP to try to regulate this, but this can cause problems of its own, so it is important to talk to your doctor before taking this. - Abnormalities in the immune system. Chronic fatigue is sometimes known as chronic fatigue immune deficiency system, reflecting the fact that some patients have problems fighting off disease. However, this does not seem to be true of everybody. - A tendency to have allergies. Again, no specific allergy or allergen has been identified. At one time CFS was known pejoratively as 'yuppie flu' because it seemed that many people who suffered from it had previously been hard working, hard living young professionals. Of course, it does not only affect these people, but some researchers have suggested that people who suffer from CFS either have been under a lot of stress before becoming ill or have lowered levels of the stress-related hormone cortisol, meaning that stress and exertion affect them more than the average person. On the other hand, this could be an effect rather than a cause of CFS. While these factors may be used to paint a picture of the 'typical' chronic fatigue sufferer, there really is no typical chronic fatigue patient. The illness can develop at almost any age from 12 to 65. There are even some patients who are older or younger than this. It affects men as well as women although the proportion of women is higher, 2:1 or more. Even these numbers are hard to judge because support groups estimate that many people who have the disorder do not consult a doctor. Besides this, many other people have these conditions and characteristics without ever suffering from chronic fatigue. So it is not really possible to say that what causes chronic fatigue is any of these factors, or even the combination of these factors. The bottom line is that nobody knows exactly what causes chronic fatigue.